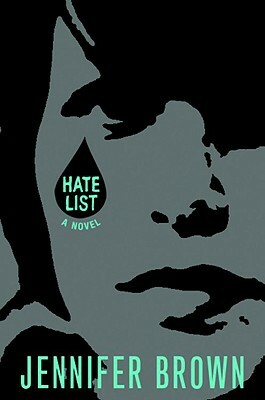 Hate List by Jennifer Brown. (Grades 9+) Little, Brown Books for Young Readers, 2009. 405 pages. Reviewed from ARC picked up at ALA.
Valerie created the Hate List, a list of people and things that she hated, including the kids who bullied her and her boyfriend Nick. When Nick opened fire on their classmates, killing several students and a teacher, Valerie was implicated in the crime, even though she was the one who stopped the massacre, getting herself shot in the process. Now, she's returning to her school, a school that's supposedly mended its ways and embraced forgiveness. Only, everything's the same. And everything's different. And Valerie just has to figure out how to live with what happened. Okaaaay, this book sat on my shelf for ENTIRELY TOO LONG. I am now kicking myself for not picking it up before because it is WONDERFUL. Once I (finally!!) picked it up, I did not want to put it down. What drew me in initially was the unveiling of the tragic school shooting from different points in time. When we first join Valerie, she's procrastinating getting ready for her first day back at school after the summer. In alternating chapters, we get her point of view as she faces everyone at school and flashbacks about the actual event. We also meet the students and teacher who were killed and injured in a series of newspaper articles. It's a very effective way of painting a complete picture of the event, through Valerie's eyes. Valerie is a layered character with a lot going on. She's dealing with her own guilt, facing the blame of everyone around her, and also missing her boyfriend. She loved Nick. She knew he was angry (she was angry, too), but she had no idea he'd actually do something like this. So, not only is she dealing with the aftermath of the shooting, but she's doing it without her boyfriend by her side. I just loved the many facets of Valerie and she seemed utterly real to me. I also loved the many, layered supporting characters, especially Valerie's parents. They, too, seemed utterly real, trying to move on with their lives after something like this happened, never certain about what their daughter's role in the tragedy was. Of course, there's Jessica, a popular girl who might have been killed except that Valerie pushed her down. Jessica seems to have really changed since the incident, but after what Nick did Valerie can't trust her own judgment enough to know if Jessica's faking it. And Dr. Hieler, Valerie's wonderfully supportive and non-scary psychiatrist. The writing is excellent in that it disappears, leaving just the story and the characters for the reader to experience. It's perfectly suited to this book, which is all about self-reflection and coming-to-terms. Not once did I pause over clunky phrasing or unrealistic dialog. Instead, I felt like Valerie was there in front of me, telling me her story. This is a moving portrayal of a tragic event and the road to recovery and forgiveness. I highly recommend it for anyone who's concerned with the welfare of today's teens. If you're looking for a book that will spark discussion, look no further. This would make a great readalike for Amy Efaw's After (which I loved) and Laurie Halse Anderson's edgier books like Speak and Wintergirls. Read more reviews at The Reading Zone, Persnickety Snark, YA Librarian Tales, A Patchwork of Books, Reading Rants, Everyday Reading, and Galleysmith (among many others). Hate List is on shelves now! And lucky us, we won't have to wait tooooo long for Jennifer Brown's next novel. Bitter End is slated to hit shelves in May 2011. I will definitely be looking for it!